In August 2014, makeup artist and Shu Uemura associate Angie Cruz moved out of her Makati pad and returned home to Bulacan. After three and a half years of renting a condo unit, she now lives in a duplex home right next to her sister's house. 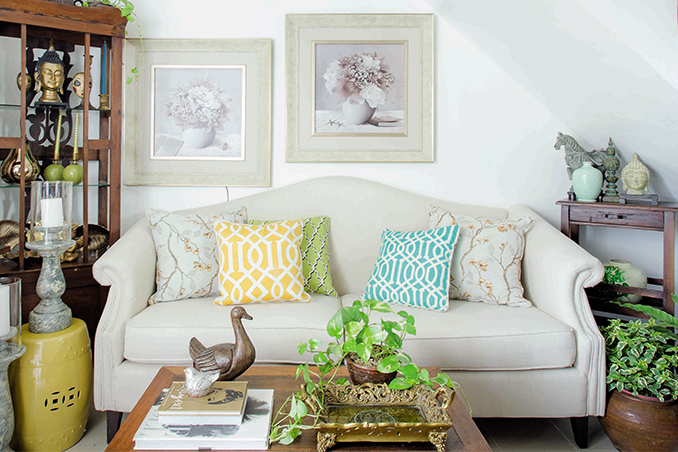 With the help of interior stylist Jayson Borja, Angie was able to create a vintage-meets-modern feel in the Bulacan property. Every area is filled with traditional carved wooden furniture complemented by modern accessories with bright colors. Unexpected opulent details like the ornate mirror, crystal chandelier, and four-poster bed complete the space. Read the original article ("Living Large") in the February 2015 issue of Real Living Magazine. Download your digital copy of Real Living on the Real Living App. Log on to summitnewsstand.com.ph/real-living for more details.